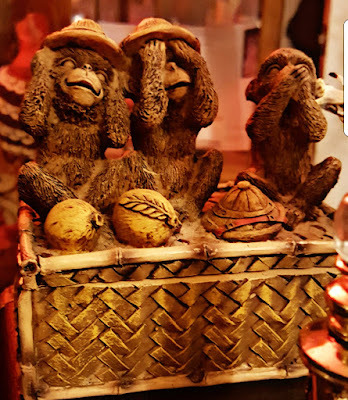 As we are half way through this full moon cycle, my three lil monkeys were the subject of my first meditation of the year. I found them a while ago on a road trip to Arkansas in a tiny "swap shop" way down in the cut. They traveled with me all the way to Chicago. They spoke to me all the way home. I dusted them off, washed them in florida water and gave them a new home on a shelf above my plants.. As I meditated yesterday I considered what it means to love unconditionally as it relates to the message my monkeys are conveying; "Hear no evil. See no evil. Speak no evil." What is the spiritual significance of this ancient symbol? Well when we hear/see evil, we ingest it, and when we ingest it the evil becomes a part of us. We then need to release it from our being, which often results in our poor choices. Hearing about/seeing violence causes us to act more violently and if left to fester in our psyche, the evil wreaks havoc on our bodies and minds. Thus, the wise maxim “Hear no evil, See no evil” reminds us that when you ‘dance with the devil,’ that energy will consume you. Speak no evil, however, refers to the outcome the first two. Hearing and seeing involve our receipt of information into the body, while speaking is our expression as a result of the information we received. Henceforth, if you see no evil and hear no evil, then you will ultimately speak no evil because your spirit will be free of the negativity you did not allow into your space. It’s simple mathematics, 1 +1=2. Here is the deal…the evil that’s all around us…in the TV, on the radio, movies, music, etc…. is much more damaging than we can fathom. It’s having more of a negative effect than we realize. It’s creating cancer in our bodies and in our minds!! Our children are constantly exposed to tremendous evil; and because we don’t realize the damage it’s doing we are not mindful of it and fail to consciously dispel it. Moreover, we are willing participants in its consumption…not out of choice, but because it’s the new normal. Our babies are born and raised into this mind-controlled society, into this corrupt system. We don’t even realize that it has all been purposely designed to destabilize us mentally and physically; keeping we, the sheeple, under control and keeping the masses sick, depressed, fearful and violent. Being somewhat unplugged (no TV or radio), I can SEE the takeover now more than ever. Grateful to my lil monkies for the reminder. “Hear No Evil, See No Evil, Speak No Evil.” I choose LOVE. All love. Only love. At all times.